A question about the price of sesame seeds – and really about the price of making homemade tahini instead of buying store-bought – got me thinking about the relative cost of “bottom-up” cooking. Yes, the tahini that you make at home is better than the tahini you buy in the store. And yes, it is great to understand exactly what is going into your food. And we tend to assume that making food at home will be cheaper than buying it at the store. But is that last benefit for real? Or is homemade tahini actually more expensive than store-bought? The cost of my time because. Quite frankly, I have fun doing it. I would volunteer to do this for free, so I’m considering the price of my labor to be zero. The cost of energy. This cost of running my food processor is minimal to me, but it’s not minimal if you factor in externalities. That said, no part of this analysis includes externalities, so it would be odd to do so just for energy. The cost of equipment, in this case the food processor. The daily depreciation on a food processor is probably quite low, and you incur that cost whether or not you use it. Maybe no one else thinks I should even consider including these things, but I want to put bounds on my analysis just to be completely clear about its limitations! This is about as much as you need to make one or two large batches of hummus. It’s a price of $0.23 per oz for fresh, homemade tahini. In comparison, the average price for four types of tahini available at Harvest Co-op in Cambridge (Cedar’s, Tohum, Once Again, and Joyva) is $0.47/oz. 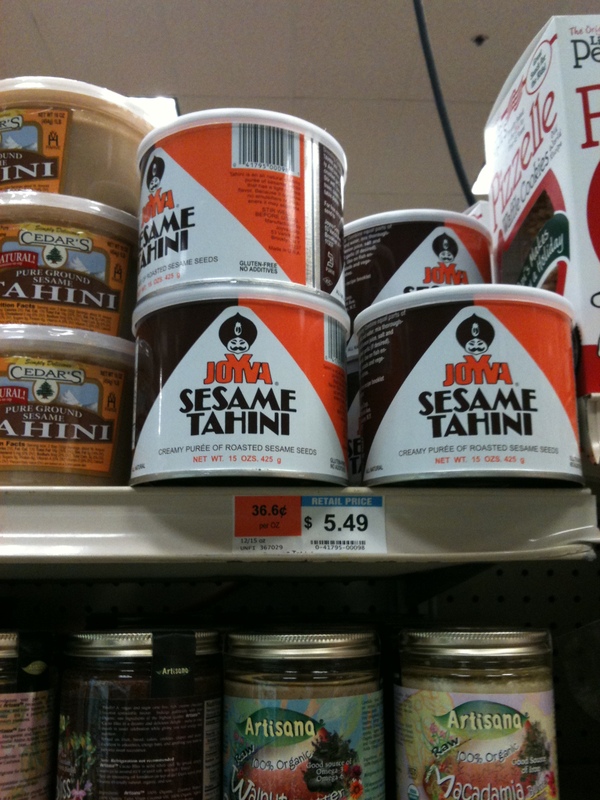 The bottom-line: In Cambridge, MA, store-bought tahini is more than twice as expensive as homemade. 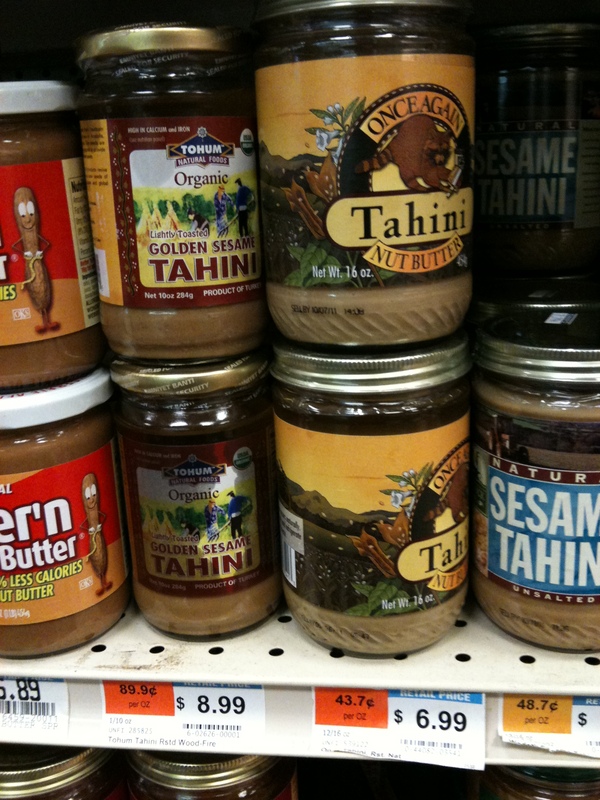 What’s more, the tahini at the store is available in big containers from 15 oz up. That’s three times the amount of tahini my recipe yields, so to use it up you’ll need to make anywhere from three to six big batches of hummus. And the tahini may well mold in your fridge in between batches, increasing the effective price that you paid per ounce. Unless you make a lot of hummus or have other uses for tahini, it just doesn’t make economic sense to buy it at the store. But what if the homemade tahini had turned out to be more expensive? In my case, I’d factor that into the cost of making bottom-up food. It would still be my preference to make tahini from scratch. But this type of analysis helps me understand the costs associated with doing so. Expect more along these lines as I evaluate the relative cost of homemade granola, granola bars, hummus, cheese, butter, and perhaps even tofu! That’s good to know. I gotta try making it myself. I also use tahini, mixed with Tamari and water to make a thinner past/sauce, over soba noodles, vegetables, millet, quinoa, etc. that sounds good, Isiris. I also found a recipe online for oatmeal chocolate chip cookies that uses tahini and they are delicious! Great stuff! I’m glad to find another person like me in the frugal/homemade department haha.